HJ: Solfeggio frequencies are an ancient science, long used by monks and other spiritually aware individuals to instill harmony and balance in the mind, body and spirit. Solfeggio Frequencies work through vibration to alter our overall brain wave patterns, which then cause a cascade of positive changes throughout the body. When these ‘lower’ aspects of ourselves are brought into balance, we come into deeper awareness and alignment with our higher spiritual selves. The tones and sound waves generated by solfeggio frequencies also have a direct harmonizing effect on the body by altering your cellular resonance. Your cells have a dominant vibrational pattern and this can be consciously manipulated or guided using specific types of sound. Although the mechanisms through which solfeggio frequencies work has perhaps not always been known, they can clearly be felt when heard and listening to them for 5 to 10 minutes or more produces a noticeable calmness and harmony in the body and mind. 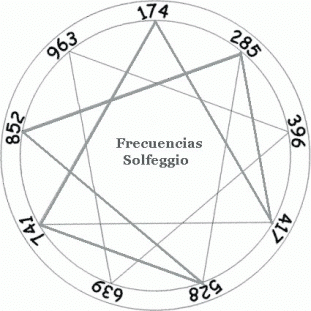 Similar to the Raga’s and the incredible sitar works of ancient India, solfeggio frequencies are the spiritual musical lineage of medieval Europe, perhaps dating back even further. After listening to the Gregorian chants in the video below, you can clearly tell they were onto something. These days you can find digital music tuned to the solfeggio frequencies, however, the body/mind responds best to organic sounds like the human voice or actual ‘analog’ instruments. The digital tones do still work, but they lack full spectrum of frequencies often present in ‘real world’ instrumentation.